JONES COUNTY, MS (WDAM) - Jones County Junior College unveiled two student-designed sculptures Friday as part of a campus beautification project. Visual art instructor Mark Brown said the campus has been working to put art in front of the visual art building for years. "It's been an idea that we've had on the back burner and the front burner for about four years," Brown said. "It's something that's really brought a lot of people together. We collaborated with many entities, not just on our campus, but also Laurel Machine and Foundry, who we have to thank, our industrial arts division, which really did a good job on this, and, of course, the students as well." Brown said Phi Theta Kappa Honor Society took over the project, and that is when they decided to open up design submissions to the entire campus. "Ironically, two visual art students were the ones that were chosen," he said. "Originally, we only wanted to do one design, however, the two sculptures were just such fabulous designs that we decided to do both." The two artists, Chip Cooley and Harley Perdue, are Laurel residents and 2015 JCJC graduates. 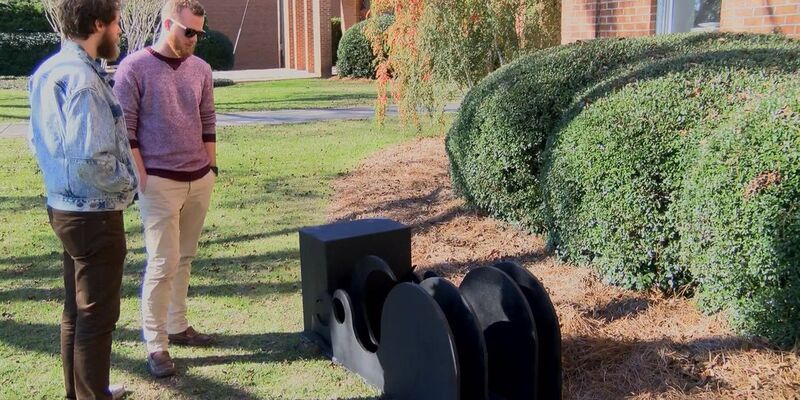 Brown said the sculptures not only bring exposure to JCJC's visual arts program and enhance the campus, but also give students a lasting legacy. "It's a great opportunity for them, and their work will be here for years to come," he said.